Be the first to share your favorite memory, photo or story of Jefferson . This memorial page is dedicated for family, friends and future generations to celebrate the life of their loved one. 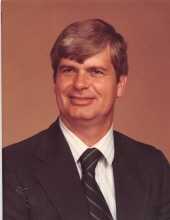 Jefferson L. Clement, age 75, of Snellville, Georgia lost his battle with Alzheimer’s disease on Sunday, March 31, 2019 with his family surrounding him. Jeff is preceded in death by his wife of 41 years and mother to his four children and five grand children, Joyce M. Clement, and his parents, Raphael L. and Gusta C. Clement. He was greatly loved and is survived by his second wife, Deborah S. Allgood, his brother, Gerald L. Clement, his children, son, Barton L. Clement, son and daughter-in-law, Bradley J. and Heather Hopkins Clement, daughter and son-in-law, Stephanie J. and Jonathan F. Blake, daughter and son-in-law, Shannon M. and Steven J. Bardsley, his stepson, William F. Riley III, his stepdaughter and her husband, Lauren R. and David M. Howell, his grandchildren, Christine C. Camp and her husband, Steven H. Camp, Katherine E. Bardsley, Harrison F. Blake, Julianne J. Bardsley and Mitchell J. Bardsley, and many nieces and nephews. Jeff was born August 5, 1943 in Blairsville, GA. He graduated from Bass High School in Atlanta in 1961. He met his first wife, Joyce, when they worked at Maryland Casualty Insurance. Jeff joined the Atlanta Fire Department in 1964 and retired his role as beloved "Captain Clem" at the Atlanta airport fire station in 1994. In retirement, he enjoyed traveling all over the US as a long-haul truck driver. He was fun-loving, a devoted husband and caring father and liked to take his family fishing and make trips to Florida. Funeral services will be held on Monday, April 8, at 3:00pm in the chapel of A.S. Turner & Sons. Rev. Don Reed will officiate. Interment will be at Floral Hills Memory Gardens. The family will receive friends from 1pm to 3pm prior to the 3pm funeral service. The family welcomes flowers or donations to the Alzheimer's Association, www.act.alz.org. To send flowers or a remembrance gift to the family of Jefferson L. Clement, please visit our Tribute Store. "Email Address" would like to share the life celebration of Jefferson L. Clement. Click on the "link" to go to share a favorite memory or leave a condolence message for the family.